Over my past 42 years as an engineer for Mercury Marine I have had numerous occasions to drive various brands of pontoon boats from 20 ft. to 26 ft. Generally, they have had on-plane handling characteristics that were not as controllable as conventional planing monohulls. These pontoon boats were powered by outboards and stern drives and had a top speed of 25 MPH. Recently I had an opportunity to drive a typical, nice looking 24 ft. pontoon boat equipped with the T.A.P. Fin System developed by Malcolm Sohm of Conrad Marine. I drove the boat, which was powered by a 115 HP outboard, in calm water, as well as in a 1 ft. to 2 ft. chop. I drove at a variety of speeds, both planing and off plane, including at wide open throttle (25 MPH). I crossed the waves at a variety of angles, and put the boat into a variety of turns from sharp to mild. My findings were that the boat handled precisely and predictably under all test conditions. The handling feel was clearly superior to any pontoon boat that I had previously driven. This was the best ride. After more than four decades as one of Fond du Lac’s top engineers and product developers, Snyder’s ears can tune in the exact pitch of the two-stroke motor accelerating. His career included nine patents to his credit, most of which aimed to improve product safety. 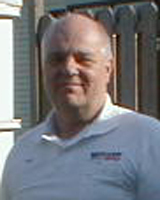 Regarded as one of the leading experts in the world, Snyder was hired out by Mercury as a consultant to investigate high-profile boating accidents nationwide. By 1984, Snyder was named director of the high-performance racing division at Mercury. By 1987, Snyder left the racing division to devote his time to product safety evaluation and engineering. He worked as director of the product and safety division until his retirement last month, but he still does contract work for Mercury.